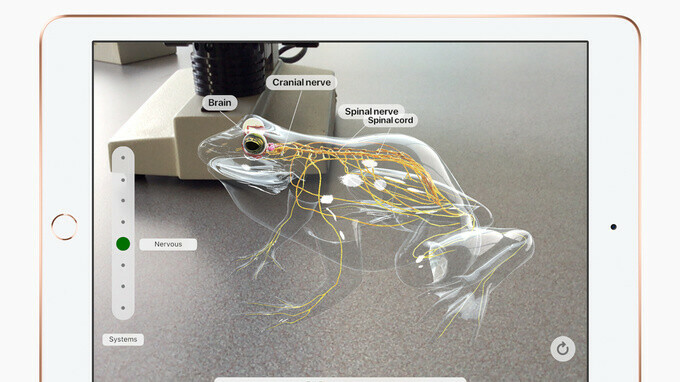 Dissecting a virtual frog – that's just one of the many things you can do on an iPad! No, seriously: exploring the innards of a toad in AR was one of the demos at today's Apple event – where a brand new iPad model was announced. This new iPad isn't Apple's best one yet. It isn't the fastest, most advanced, or best-looking iPad ever released. Instead, it has a much more noble goal – to be the best tablet for the classroom. That's great and all, but what makes it different from Apple's other recent iPads? Weren't they also ideal for school use? Allow us to elaborate on that. There's not a whole lot to say about Apple's latest iPad. It look and feels much like last year's affordable, 9.7-inch model – with an aluminum body, high-res touchscreen, and a Touch ID fingerprint reader embedded in the home button. As expected, the 10.5-inch iPad Pro would give you a bit more screen space to work with, but it is also a bit bigger physically. Fancy extras like ProMotion (120Hz refresh rate), Wide Colors, and True Tone Display are only available on the iPad Pro. Software and functionality: Apple Pencil support, at last! Powered by the latest iOS release, the new 9.7-inch iPad isn't all that different from any other iPad when it comes to software. At today's conference, Apple showed off a bunch of new education-oriented and AR-powered apps, but these will be available on any other iPad, while the ability to share an iPad between several students, with personal accounts for each, has been available for a while. What's new, however, is that the latest iPad works with the Apple Pencil. Using the digital stylus, students will be able to take notes or add drawings to their documents, while teachers will be allowed to add comments to work that's been handed in. While all iPad Pro models are compatible with the Apple Pencil, last year's affordable 9.7-inch iPad wasn't. One thing to note here is that unlike the iPad Pro, the new iPad can't be used with Apple's Smart Keyboard. It will, however, work with any Bluetooth keyboard, while Logitech has a 49$ stylus called Crayon that could be an excellent alternative to Apple's pricier Pencil. The Logitech Crayon is an Apple Pencil at half the price! Apple has chosen to use the A10 Fusion chip inside its latest iPad. This is the same silicon we saw inside the iPhone 7 and it makes the new iPad model more powerful than last year's 9.7-inch model, but still not as capable as an iPad Pro. Also worth pointing out is that with the new iPad, students will be given 200GB of free Apple Cloud storage – much better than the measly 5GB everyone else gets. Pretty neat! Of course, Apple had to cut some corners to deliver an affordable iPad. The new 9.7-inch model appears to have what's practically the same camera we had on last year's affordable iPad: with 8MP of resolution and 1080p video support. At the front is an identical 1.2MP camera. The sound setup hasn't changed much either, retaining the stereo down-firing speaker setup. In comparison, the 10.5-inch iPad Pro has a lot more to offer. Its higher-resolution camera is more sensitive to light and has optical stabilization for better stills, while video can be recorded at 4K. The quad-speaker array completes the whole package. $329 for an iPad is great. That same price for an iPad with an A10 inside? Even better. I might pick one up in a few weeks with how cheap they are off jump. I'm getting one on a deal. The older one had frequent deals. A big difference is the new iPad still only has 2 GB of RAM compared to the pros. Why would PhoneArena leave that difference out? Oh, yeah comparing specs to them can only should good stuff, and leave out the negative stuff. Why are you so butthurt and concerned about what apple does? Is your life so tragic and pathetic? If you're broke... yeah. Otherwise, they really, really aren't. I have a Chromebook (two in fact) in my home and they're both garbage app wise. Schools systems are broke so Chromebook makes more sense for their use case. They’re broke because greedy district officials and the Education board members keep all the the money that’s supposed to go to the kids. Sad, cruel reality of the American education system. I agree as Apple has no true competing product to the G Suite. Why invest in iCloud in which Google provides free storage. Plus Chromebook is almost a true laptop with laptop functionality over a tablet with iOS. What Apple did was handicap and deprived the kids from typing on physical keyboards. This has become a society pitfall. Price wise is pretty good. Like the Apple Pencil support. But 32 gig just not enough. When the next pro model comes out I’m looking to upgrade my Air 2 which has been a excellent device from Apple. That and the x plus edition is on my budget. The upgrade from my air 2 to the pro 10.5 was huge. But one issue, not many keyboards! Yeah because literaly every bluetooth keyboard on the planet does work with iPad? And if i am not mistaken even every USB one as well. I think he is talking about those keyboard cases, because the 10.5 inch is different from the normal 9.7inch since the OG air, not many keyboards are designed to fit that size as of now. The screen is way behind the Pro models. For me it's a no. For someone who accepts the lower quality screen it's a good buy. I really want to buy an iPad, that's the only apple product I want to buy or may ever buy if things remains the same. But, I am interested in the new iPad mini with 8 inch and slime bezels. I have learned from my usage of tablets that there are two important sizes to consider. 7-8 inch is the best dimension for reading and consuming social media, easy to hold and easy to type in. Easy to use in bed while watching youtube and not having to contain the heavy weight that comes from big screens. 10.5-13 inch is way better for outgoing (supposed it comes with full utility OS like windows 10, MC OS and others). In that case you can leave your laptop at home and still be able to do some light work when you are out. If not, I better just get a light weight 12-13 laptop So, I am waiting the next 7-8 inch iPad from Apple and I will be the first to preorder it. Resolution should not be less than FHD. Please explain me hidden genius behind "stereo" speakers on one side of the device? I bet it's dolby atmos. Did anyone notice that the 9.7 Pro has become almost non-existent despite its almost total resemblance of the new 9.7? Why is it not at all mentioned in this topic? Does it have 2gb ram like the old model, or 4gb ram? This launch was bad. There was no value to this launch...It was only a response to the Chromebook Tab. Apple should have said this... Base price = $299/$329 + $99 Apple Pencil + $99 Folio Case = $498/$529 + tax. That's the real price. There was no value to this launch at all. If Apple added the Apple Pencil to the launch of the iPad then there is value. You can essentially buy an iPad Pro 10.5's around $440-$450 on eBay. You’re actually saying something reasonable, because it makes sense! Never thought I would see the day. as far as i'm aware of, ''iPad Pro 10.5 on eBay'' doesn't include Apple Pencil and a case. include all of that and it would be way more than just 440-450. (and it is around £500 here in UK). So what's the point. All the accessories are optional. Don't need them? Don't buy them. Also you're not forced to purchase Apple accessories. even if the 10-inch iPad would include all accessories on eBay, there's a fat chance the tablet is either used or refurbished in a questionable grade. this argument makes practically no sense to me. Am I missing something. Plus Apple should have reduced the iPad Pro 10.5 down to $349 rather than try to create a new product update. The new edge to edge iPad's are going to release within the next few months.